Toshiba's C3030 range didn't really get off to a flying start with the 32in model, with its irritatingly bumbling execution of hi-def pictures. So, you can forgive us for not being over the moon at the prospect of getting to grips with Toshiba's latest instalment of this entry level series of LCD TVs, the 37in 37C3030. Things bode better than expected when we discover that the 37C3030 looks pretty snazzy for a self-confessed entry level TV, cutting some contemporary dash in a sturdy black shell. The 37C3030's specifications are solid enough, if nothing out of the ordinary, as this is a HD-ready TV, with a native resolution of 1366 x 768 and a relatively high contrast ratio of 5000:1. This contrast ratio is made possible by an automatic backlight adjustment system, in which pictures have their brightness reduced during darker scenes to boost black level response, a feature that the 37C3030 shares with its underwhelming 32in sibling. While these dynamic contrast systems do deliver better black levels, they don't meet with the standard set by plasma TVs. 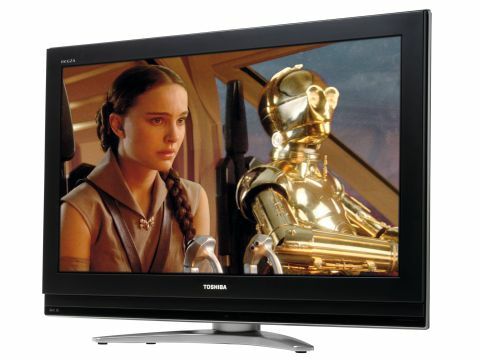 As well as the backlight adjustment system, the rest of this 37in hi-def TV's feature count is on the money, with it being able to accept 1080p feeds, and carrying Toshiba's Active Vision LCD image processing engine on board, which promises to improve colour saturation, fine detailing, black levels and motion handling. There's also a digital tuner, some noise reduction routines, and bass booster - all in all, it's not bad for a relatively basic TV. Connectivity is also suitably decent. Two HDMIs (able to accept those 1080p feeds) lead the attack, followed by component video input, two Scarts (one RGB-enabled), a subwoofer line out, a PC video input, and a CAM slot (for adding the pay-TV Top Up TV package to Freeview). Unleashing our recording of The Illusionist from Sky upon the unsuspecting 37C3030 produced some unexpectedly good results, particularly in light of the previously disappointing 32C3030. For starters, the 37C3030 easily outguns its 32in junior: black levels are impressive for an entry level HD-ready TV, as the theatrical illusions don't look washed out, and the historically sumptuous scenes are given some welcome authenticity. Colours are also extremely vibrant, giving Ed Norton's magical feats visual wallop, and fine detail levels are also better than we hoped they would be. So far, so unexpected, but we are brought back down to earth with some elements of those black levels: although they're deep enough for a TV of this stature (and price), dark images can look a little hollow, and consequently struggle to entirely convince. Also, fast-moving sequences lose more sharpness than we'd like, and there's the shadow of artefacting cast over standard-def programming. Disappointing as these issues may be, we're happy to emphasise the positive contributions that the 37C3030 makes to LCD TVs. The quality of pictures that it's capable of delivering exceeds the pitifully low asking price of £950. Although hi-def pictures from a sub-£1,000 HDTV will never be perfect, the 37C3030 is a valiant attempt to bring 37in hi-def thrills to the masses. And that in itself has earned this TV a cautious recommendation.